August 25th is New Mexico's day in recognition of young parents! Yes, you read that right WE HAVE OUR OWN DAY in New Mexico. To honor our day and as a way to connect with more teen and young parents from around the country as well as organizations from around the country that support us, there will be a Twitter chat. The Twitter chat is being organized by Young Women United and will have organizations and teen parents from around the country joining in. 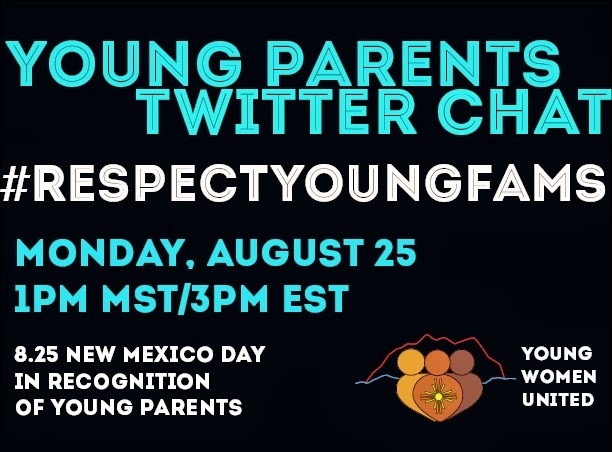 Please mark your calendars and join us on August 25th at 12pm PST/1pm MST/ 3pm EST time at the hashtag #RespectYoungFams to join!